The Bates College Office of Multicultural Affairs hosts Dan Taulapapa McMullin, a Samoan American writer, painter and filmmaker, as a weeklong artist in residence. Beginning Monday, Oct. 8, McMullin will make several presentations in commemoration of Coming Out Day and Anti-Columbus Day to which the public is invited to attend at no charge. McMullin gives a lecture titled U.S. Territory of American Samoa and Pacific Island Sovereignty at 4:15 p.m. Monday, Oct. 10, in Skelton Lounge, Chase Hall, 56 Campus Ave.
An opening reception for his exhibition, Surrounding the Shell: Coming Our on Many Level, My World as a Samoan Fa’afafine Artist, follows his talk, at 7:30 p.m. in Chase Hall Gallery. McMullin gives a second lecture titled Here is the Fire that Devours Me’: Tahitian Activism and Spirituality in the Poetry of Henri Hiro, at noon Tuesday, Oct. 11, in Skelton Lounge of Chase Hall. At 4:30 p.m. in Chase Hall Lounge, McMullin screens his award-winning film Sinalela, followed by a lecture titled Sounding the Shell: Coming Out on Many Levels. McMullin offers a second screening of Sinalela and a poetry reading at 7 p.m. Wednesday, Oct. 12, in Skelton Lounge, Chase Hall. McMullin engages audiences in the South Pacific, North America and Europe with stories that take place in the Samoan Diaspora. His 2004 illustrated poetry chapbook, A Drag Queen Named Pipit, and 1996 performance poem, The Bat, garnered a 1997 Poets & Writers Award from The Loft. “Sinalela” received the 2002 Honolulu Gay & Lesbian Film Festival Best Short Film Award. 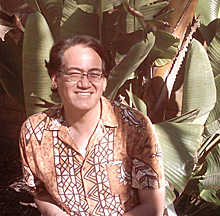 McMullin’s political essays on colonization in American Samoa contributed to the 1999 Gustavus Meyers Humanitarian Award-winning book, Resistance in Paradise. He recently completed his forthcoming book, The Only Paradise is Paradise Lost. For more information about McMullin’s Bates visit, call the Office of Multicultural Affairs at 207-786-8376.